Did the body of Christ in the first century have popes, cardinals, bishops, pastors, ministers,monks, nuns, priests, ruling elders, clergymen, and other functionaries? What does Scripture say? Soon after the days of the apostles and continuing until today, people have manifested their discontent with God’s ways by devising various forms of church authority and leadership that deviate from the pattern revealed in holy Scripture. The variety of these systems of church government seems to be endless. Some religions, such as Lutheranism and the “Assemblies of God Church,” set a “President” over the denomination. Others, such as Methodism, Catholicism and Episcopalianism place “Bishops” over multiple congregations in a district or diocese. Roman Catholicism, the most complex and hierarchical of religious groups, has traditionally placed a “Pope” or “universal bishop” over the entire world church (of more than one billion people)! Cardinals are his special advisors. Under him are arch-bishops, bishops, and parish priests. The Episcopal and Anglican Churches likewise espouse the bishop system. The “Orthodox Church” places a “Patriarch” over each national church within her ranks. Presbyterianism elevates a “ruling elder” over fellow elders, all of whom are over a congregation, then establishes a district-wide “presbytery” to decide policies beyond the congregation. The Southern Baptist Church elevates a leader called a “Pastor” over the local church, along with a board of deacons, but each church specifies “messengers” who are sent to a central location each year to decide policies for the Convention. Many fundamentalist independent Baptist churches are ruled by the local pastor. President, vice-president, superintendent, pope, archbishop, cardinal, trustee, bishop, apostle, patriarch, nun, monk, priest, mother superior, sister, council member, pastor, general overseer, messenger, senior pastor, ruling elder, minister, associate minister, assistant pastor, associate pastor, youth pastor, recreation minister, usher, parson, vicar, rector, deaconess, board member, and a host of others! Needless to say, this usage is entirely foreign to the way of Christ, nevertheless it is practiced by the majority of those within Christendom. God planned that the community of Christ would have an arrangement far different from these humanly-devised systems. The Lord gave a glimpse of the kind of “leadership” that would be exercised among His followers when He said, “You know that the rulers of the Gentiles lord it over them, and their great men exercise authority over them. It is not so among you, but whoever wishes to become great among you shall be your servant, and whoever wishes to be first among you shall be your slave” (Matt. 20:25-27). Jesus refers to the Pharisees with these words to His followers: “They love . . . respectful greetings in the market places, and being called Rabbi by men. But do not be called Rabbi; for One is your Teacher, and you are all brothers” (Matt. 23:6-8). Those who would be over their fellow-believers must exercise their position with a servant’s heart. We are all “brothers” in the family of God and are equal at the foot of the cross. Even the apostles, who were given a unique position of authority, chose to be servants and sought to persuade rather than coerce—although they were capable of exercising authority particularly with the Word of God (cf. 1 Cor. 4:21; 2 Cor. 10:8; 12:19-13:4,10). In New Testament times, in each mature community that had been fully “set in order” (Titus 1:5) and that had qualified men (1 Tim. 3:1-7; Titus 1:5-9), God placed a plurality of “elders” (presbuteroi) (cf. Acts 11:30; 14:23; 15:2,6; 20:17,28; 1 Tim. 5:17; Titus 1:5; James 5:14; 1 Peter 5:1; see also Phil. 1:1). Thus, instead of a “bishop” being over a plurality of assemblies, an assembly was overseen by a plurality of elders or overseers. The elder is sometimes called an “overseer” (apiskopos) (Phil. 1:1) or a “shepherd” (poimen) (Eph. 4:11). Actually, these terms were used interchangeably (see the Greek renderings in Acts 20:17 with v. 28; Titus 1:5 with v. 7; 1 Peter 5:1 with v. 2). One writer explains, “The term ‘elder’ indicates the mature spiritual experience and understanding of those so described; the term ‘bishop,’ or ‘overseer,’ indicates the character of the work undertaken. According to the Divine will and appointment, as in the N.T., there were to be [overseers] in every local church” (W.E. Vine, The Expanded Vine’s Expository Dictionary of New Testament Words, s.v. “Bishop”). It might also be pointed out that men who carried on this work were local men (Acts 20:28; 1 Peter 5:2) and were appointed from the local membership (cf. Acts 14:23; Titus 1:5) rather than imported from other geographical areas. Further, these functionaries were required to meet rigid qualifying standards—such as being able to teach and knowing the “faithful word”; being males who were married; having children who believe and were not rebellious, unruly, or disobedient; having a good reputation; and many others (cf. 1 Tim. 3:1-7; Titus 1:5-9). Along with the elders or overseers, who were particularly concerned with the spiritual oversight of the flock, there were also “servants” of the assembly (diakonoi) who were probably more concerned with the material, physical, and financial needs of the believers (cf. Phil. 1:1; 1 Tim. 3:8-13; Acts 6:1-6?). Just as in the case of the overseers, these servants also must meet certain qualifications before they are appointed. Other functionaries were also part of the early apostolic communities—such as the “teacher” (didaskalos) (Acts 13:1; 1 Cor. 12:28-29; Eph. 4:11; Heb. 5:12; James 3:1) and the good news “proclaimers” (euangelistes) (Acts 21:8; Eph. 4:11; 2 Tim. 4:5). Apparently when an assembly of believers did not have qualified or eligible mature men to be appointed as overseers (cf. 1 Tim. 3; Titus 1), the evangelist who was involved in the early stages of the assembly exercised a leading influence (cf. Titus 1:5; 2:1, 15; cf. 1 Timothy 3:14-15; 4:6-16; in the latter case, elders were present—cf. 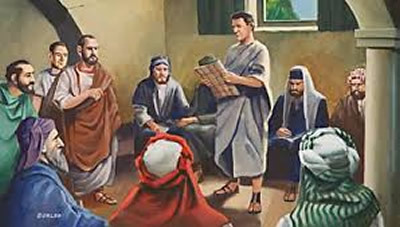 Acts 20:17, 28), along with mature teachers who nurtured the assembly until elders could be appointed to oversee a local work. Yet apparently all mature and sound men were involved in the ongoing work of the community. Others, such as “sent ones” or apostles (apostolos) (Matt. 10:2; Acts 1:26; 2:14,37) and “prophets” (prophetes) (Acts 13:1; 15:32; 21:10; 1 Cor. 14:29,32,37) served as the “foundation” of the New Testament assembly (cf. Eph. 2:20; 3:4-5; 4:11-16; 1 Cor. 12:28-30). These apostles and prophets provided the “revelation” of the mystery that brought people to a saving knowledge of Christ Jesus (Eph. 3:5) and this function lasts until this day. Although these were positions or works within the early community, we must remember that every believer was on the same plane. This is why they were all called “brothers” and “sisters” or “children” within God’s family (James 2:15; 1 John 3:1-2). Jesus said that His coming assembly would not have a hierarchical arrangement. As we noticed earlier, all were to consider themselves servants of the others. In one sense, all believers are part of the “clergy” (from the Greek kleros, meaning “one’s portion”). “In early Church history ‘clergy’ referred to all the members of a Christian community. By Tertullian’s day [ca. AD 200] it was used of ordained bishops, priests and deacons. Today it refers to ordained ministers of the church, in contrast to the laity” (Miethe, The Compact Dictionary of Doctrinal Words, p. 60). Furthermore, every believer is part of the “laity”! Laity comes from the Greek laos (“people”) or laikos (“belonging to the people”). “Originally the word referred to the whole Church, all the people of God. Today the word unfortunately contrasts those not ordained to professional ministry (laity) with the ordained (clergy)” (Ibid., p. 126). Therefore, the present day “clergy-laity” distinction that so thoroughly permeates churchianity was unknown in the early community of saints. One of the striking things we notice as we compare the Scriptural organization above with the systems that various denominations have devised is that the Biblical way is simple and just what the Lord wanted. Concerning spiritual gifts in general, Paul wrote, “To each one is given the manifestation of the Spirit for the common good. . . . One and the same Spirit works all these things, distributing to each one individually just as He wills. . . . God has placed the members, each one of them, in the body, just as He desired” (1 Cor. 12:7,11,18). Just as God worked in this way in the distribution of spiritual gifts, so God has specified the organization of the body and has revealed the particular works and positions that are to be found within the body. In fact, within the body of Christ, there is a place for everyone to participate in the exercise of the abilities that God has provided (cf. Eph. 4:11-16; 1 Peter 4:10-11; Romans 12:3-8). No one is without a work to do! Young and old, male and female, educated and uneducated, and believers from various backgrounds—all can be used of God in His spiritual family. As we submit to His plan in this area, we can have the confidence that we are part of the community that Christ is building. Are you willing to submit to the Lord’s plan and seek to follow the pattern He left for His body?